This product requires the base game Magicka 2. The most overpowered and irresponsible wizards known to fantasy are back! Introducing the Magicka 2: Cardinal Points Superpack DLC! Three new Challenges - introducing environmental dangers to Magicka 2's Challenge Maps! Hordes of bloodthirsty enemies pour out from mysterious gates in the North, South and East, each with unique environmental dangers! One of the Challenges is truly a challenge – Bragging rights included! Winter Ruler Robe, a Staff of the Ice Breaker and a mighty Icicle Mace Weapon. Raiments of Arobea Robe, Staffed Camel Staff and Dessert Cutter Weapon. 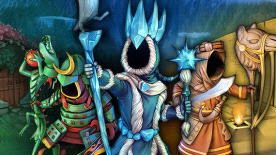 Magicka 2 is required to play this DLC.